With all the fiscal troubles in Greece, Spain, Ireland, Portugal, and Italy, there’s not much attention being paid to Cyprus. But the Mediterranean island nation is a good case study illustrating the economic dangers of big government. For all intents and purposes, Cyprus is now bankrupt, and the only question that remains to be answered is whether it will get handouts from the IMF-ECB-EC troika, handouts from Russia, or both. Here’s some of what has been reported by AP. Cyprus’ president on Thursday defended his government’s decision to seek financial aid from the island nation’s eurozone partners while at the same time asking for a loan from Russia, insisting that the two are perfectly compatible. …Cyprus, with a population of 862,000 people, last week became the fifth country that uses the euro currency to seek a European bailout… The country is currently in talks with the so-called ‘troika’ — the body made up of officials from the European Commission, the European Central Bank and the International Monetary Fund — on how much bailout money it will need and the conditions that will come attached. Locked out of international markets because of its junk credit rating status, Cyprus is paying its bills thanks to a €2.5 billion ($3.14 billion) Russian loan that it clinched last year. But that money is expected to run out by the end of the year. So what caused this mess? Is Cyprus merely the helpless and innocent victim of economic turmoil in nearby Greece? That’s certainly the spin from Cypriot politicians, but the budget data shows that Cyprus is in trouble because of excessive spending. This chart, based on data from the International Monetary Fund, shows that the burden of government spending has jumped by an average of 8.3 percent annually since the mid-1990s. My Golden Rule of fiscal policy is that government spending should grow slower than economic output. Nations that follow that rule generally enjoy good results, while nations that violate that rule inevitably get in trouble. Interestingly, if Cypriot politicians had engaged in a very modest amount of spending restraint and limited annual budgetary increases to 3 percent, there would be a giant budget surplus today and the burden of government spending would be down to 21.4 percent of GDP, very close to the levels in the hyper-prosperous jurisdictions of Hong Kong and Singapore. Actually, that’s not true. If the burden of government spending had grown as 3 percent instead of 8.3 percent, economic growth would have been much stronger, so GDP would have been much larger and the public sector would be an ever smaller share of economic output. Speaking of GDP, the burden of government spending in Cyprus, measured as a share of GDP, has climbed dramatically since 1995. A simple way to look at this data is that Cyprus used to have a Swiss-sized government and now it has a Greek-sized government. 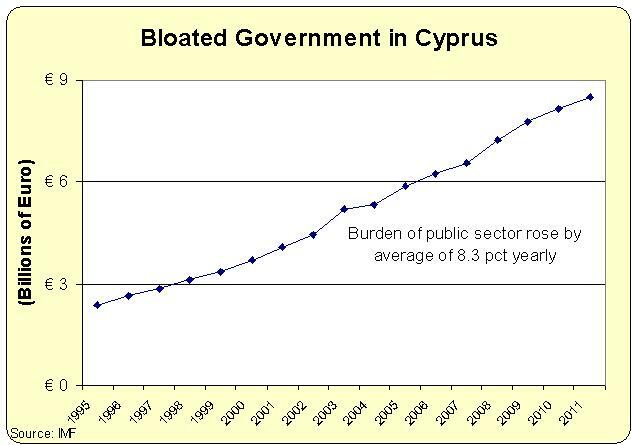 Government spending is just one of many policies that impact economic performance, but is anyone surprised that this huge increase in the size of the public sector has had a big negative impact on Cyprus? Interestingly, if government spending had remained at 33.9 percent of GDP in Cyprus, the nation would have a big budget surplus today. Would that have required huge and savage budget cuts? Perhaps in the fantasy world of Paul Krugman, but politicians could have achieved that modest goal if they had simply limited annual spending increases to 6 percent. But that was too “draconian” for Cypriot politicians, so they increased spending by an average of more than 8 percent each year. What’s the moral of the story? Simply stated, the fiscal policy variable that matters most is the growth of government. 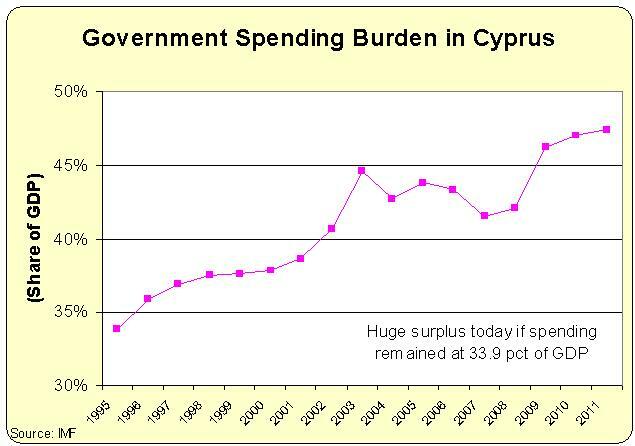 Cyprus got in trouble because the burden of government grew faster than the productive sector of the economy. That’s the disease, and deficits and debt are the symptoms of that underlying problem. Europe’s political elite doubtlessly will push for higher taxes, but that approach – at best – simply masks the symptoms in the short run and usually exacerbates the disease in the long run.